The use of electricity in the IT sector has both financial and environmental significance. 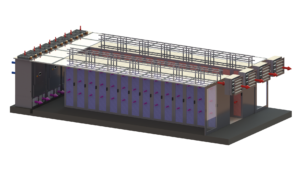 Many data centres consume as much electricity in their cooling systems as in their servers. This has both cost and power availability implications. It is believed the IT sector has a bigger carbon footprint than air travel and consumes over 5% of the developed world’s electricity. Many operators want to reduce their impact on the environment by consuming less energy. In very cold climates such as the Nordics and Arctic circle, where ambient temperatures never exceed 25°C, fresh air can be used all year round to cool a data centre. This is called free cooling and EcoCooling’s ECV range is designed specifically to exploit these climates to achieve world-class levels of efficiency without the need for supplementary cooling. However, in warmer conditions, or when IT equipment requires cooler inlet temperatures, free cooling alone cannot meet the required internal conditions, supplementary cooling is required on the hotter days. 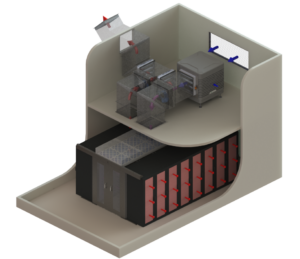 SMARTech Cooling uses direct evaporative cooling in their products and systems as an energy efficient and reliable alternative to refrigeration for data centre cooling. N.B. In ECV FreeCooling systems there are no evaporative cooling media, therefore, there are only 2 modes of operation, ventilation and attemperation. CREC installation with filter walls and EC fans. When fresh air is used in a data centre there can be a risk of either particulate or gaseous contamination. The quality of the air in the locality of the data centre can affect the feasibility of the use of fresh air. It is now normal to fit filtration to a minimum of EU4/G4 standards. We would usually advise dual filtration for IT installations. Air intake filtration (pre-filter jackets) is designed to eliminate potential contamination from external air. In addition cartridge filters can be used in either ducting or as replacement ceiling tiles to filter the recirculated air. Increased speed control: EC technology enables continuous adjustment of the fan speed to meet the cooling demands of the data centre. The control systems are designed to take advantage of the energy savings which can be gained by reducing fan speeds. Low power usage at partial loads: The effect of fan speed on power drain is governed by a cubed relationship, meaning that at half the speed the fan will be using an eighth of the electricity. Operating the system at half speed reduces the fan energy use by over 85%. Internal Product Range (ECT): Compact and Flexible Solutions – The ECT range of coolers are designed to be installed internally. 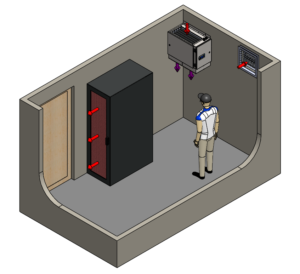 Multiple configuration options allow for air to be supplied either directly, through ductwork or raised floors. Single box unit including the control system, supply fan, cooling system and dampers. For complete peace of mind, a sophisticated leak detection and alarm system have been incorporated into all of our internal products. Humidification: ECT units can be fitted with a humidification option to avoid low relative humidity non-compliance. External Product Range (ECP): Proven Technology and Results – With over 3000 installations worldwide, the ECP range of coolers can be installed externally or inside a plant room. The standard unit is down-flow, however, top and side discharge configurations are available. 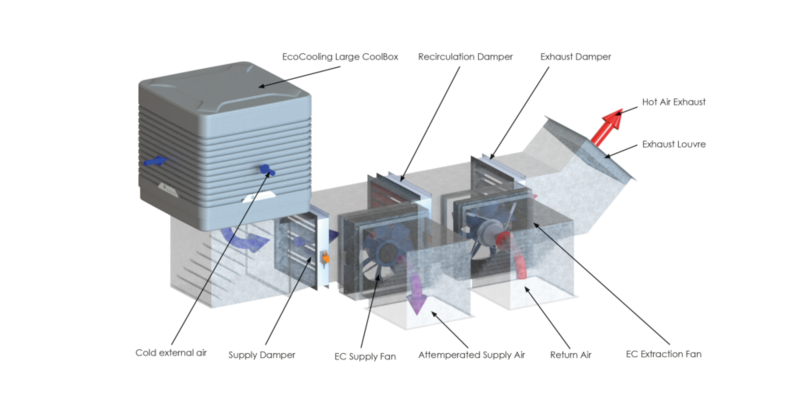 FreeCooling (ECV): ECV units are designed to be installed internally. They comprise of fresh air free cooling systems with inbuilt filtration, dampers and controls, without the evaporative cooling element.